And here I am, guiding people through yoga six times a week, speaking sage advice of taking time for yourself, concentrating on your breath, and manifesting internal warmth despite the frigid temperatures. At least, it totally sounds sage when it’s coming out of my mouth. Those on the mat in front of me are the only ones that can truly attest to that I suppose. But I think we all know that it’s easier to give advice than to heed it. So as I tell my yogi students to be gentle with themselves, I continue to beat myself up with negative self talk. As I tell them to give themselves the gift of time, I pick up extra shifts at the restaurant. “Live your yoga,” my friend said to me. Really? Start following my own sage advice? That just seems crazy. And sometimes I think we just need to pout. So pout I did. I told myself that I would buck up buttercup when the calendar turned to February…or when I could again wear flip flops. I knew the tricks I could use to try to get myself into a better mood. But heaven forbid I use them and break the tremendous pout cycle I had going on. I should make myself a checklist for next time…. Ash, have you had a good cry? Well, no…. But it wasn’t for lack of trying. I’m a woman, therefore a little more in tune with this one. Emotions are not always bad and need to be released. I know this…I do. But I felt like I couldn’t even eke one out. My eyeballs felt dry. And then finally, a few days ago, as I was cleaning I pulled out Maggie’s old dog stuff to see what I already had in case of new adoption (more on this later) and as I took her bed out of the closet where it had been hiding since July, that was it. I sat down on the floor, bed in arms, cross-legged and wailed into my hands for a good ten minutes. “I wish I could tell you that it got easier,” I said to a friend about an hour later who had just lost her beloved dog. It was a sad moment but afterwards I felt refreshed, renewed, like a new person. Ash, have you cleaned your house? Working four jobs gives one a great excuse for letting dust bunnies go unchecked and for piles of stuff to form throughout corners of one’s small apartment. But the other day, I had almost four hours in which I had no commitments. Woo hoo! So I began to clean. And as the dust got swept away, as the piles turned into neater and much more organized piles, as I began to do things that had been haunting my to-dos for weeks, something began to lift. I was taking control of my life–starting with my messy apartment. Sometimes I just need to check myself. Because life is good. Yes, I have a lot of jobs. But I really like all of them. And maybe the weather was icy and cold last week. But around here, if I just hold my breath long enough, we are given brief respite with 70 degree days in January. And maybe it’s been getting a little lonely here in my life. But I have a feeling that there’s a four legged creature out there somewhere that would be willing to help with that issue. Ash, have you tried writing? That always makes you feel better…..
So…it’s mid-January. Here in West Virginia, the weather is downright icky. It’s cold. It’s rainy. It’s damp. When I was in Florida a couple weeks ago, it was warm and sunny and I was wearing flip flops. Upon my return to winter, I joked with friends that I was suffering from PTFD…Post Traumatic Florida Syndrome. I don’t think I’m alone here. We’ve moved past the glitz and glamour of the holidays and gone are the twinkling lights and shiny orbs that rested on pretty green trees. And we’re still a couple months away from spring springing. It’s a little more difficult to find beauty in these days. But yet for the past week, it’s exactly that theme that has been running around in my head. Back in December, I was leaving the grocery store when something caught my eye on the bulletin board that was tacked up in the entryway. Amidst ads for used computers and housecleaning services, there was a white piece of paper, 8 ½ by 11, and typed out in black ink were the words “There is Something Beautiful in Every Day. You Just Have to Find It.” I smiled. I took a picture. And then I didn’t think about it much for a while. After all, I had the sparkly entrapments of Christmas and then cinnamon-colored beaches of Florida. Jumping ahead to my bedroom redecorating project….trust me, I’ll pull this all together. When I moved into my new apartment in July, I borrowed a bed frame from a friend, bought a nightstand at a yard sale, took an old comforter from my parents, a lamp from a friend, and pulled a dresser out of my parents’ garage that belonged to me when I was probably eight years old. Slowly but surely, I am turning my bedroom into my little sanctuary….a new lampshade here, a fake flower arrangement there, a new comforter set and, sometime in the next few months when I find an ounce of free time, a repainted dresser. So I got these picture frames from Target, a set of four small frames in varying shades of turquoise to match aforementioned new comforter. I went through the pictures on my hard drive to find some of my favorites to fill up the frames. I picked out four random pictures…or so I thought. 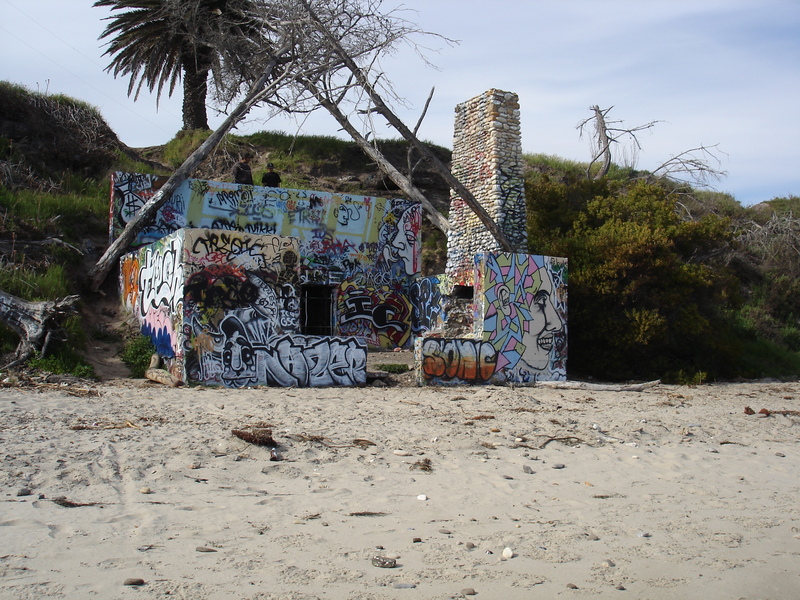 There was a photo of an old stone structure on the beach in Santa Barbara, covered every inch in graffiti. There was a photo of a gazebo at the park in mid-winter, strung in forgotten holiday lights. There was an abandoned sandcastle covered with shells. 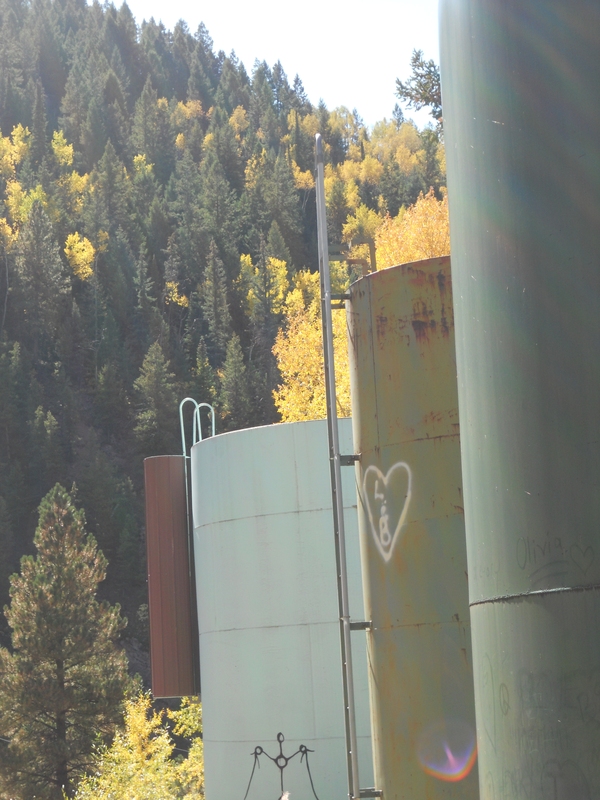 And finally, there was a photo of water tanks sitting high on a Colorado mountain, flanked by changing leaves. All four pictures captured things that were seemingly mundane, but which caught my eye, made me take pause, and snap a picture. And now, resting in those frames, they are really things of beauty. I suppose I could’ve walked past all these scenes, too involved in the daily distractions of life. But because I paused, I now have these really cool things to hang on my wall that bring a smile to my face. And as I looked at the four pictures, the poster in the grocery store came to my mind. There is something beautiful in every day; you just have to find it. And so that’s what I’ll challenge myself with the next couple of weeks when the weather is gloomy and there is no ocean to dip my toes into—finding beauty in the mundane, so that maybe one day it becomes part of my sanctuary. Borrowed from my friend Leah…who borrowed it from someone else.. So, therefore, instead of listing my resolutions here, I shall share with you my intentions…. 1) Meditate more often. This may be the toughest one to adhere to but the one that I need the most. 3) Be more hesitant when approaching relationships and less hesitant when approaching other new opportunities. 5) The only diet-related resolution….just quit the Max and Erma’s cookies at 10pm at night. In fact, quit the Max and Erma’s cookies period. 6) Drink more hot tea (because it’s good for me) and dirty martinis (because they’re delicious). 8) Keep working on that third chakra. The second and fifth ones need a little bit of help as well. 9) Create more time to e-mail/call/text friends that are far away. Because they rock. And deserve to know that. 10) Slowly start discarding negative self talk from head. I spent a whole learning about mantras. It’s time to start putting that stuff to work. 11) Run because it ignites my spirit. Yoga because it feeds my soul. Lift weights because I love feeling strong. Do none of these in order to look better in clothes as the primary reason. This, however, is a wonderful side effect. 12) Go to bed earlier. Continue to wage battle with the snooze button. Drink less coffee. Why do all of these seem related yet mutually exclusive? 13) Take time in the morning to set an intention for the day. Take time at night to reflect. 14) Read more. Dance more. Take more hot baths. These should be easy enough…. 15) Be gentle with myself if any of these resolutions/intentions go astray.